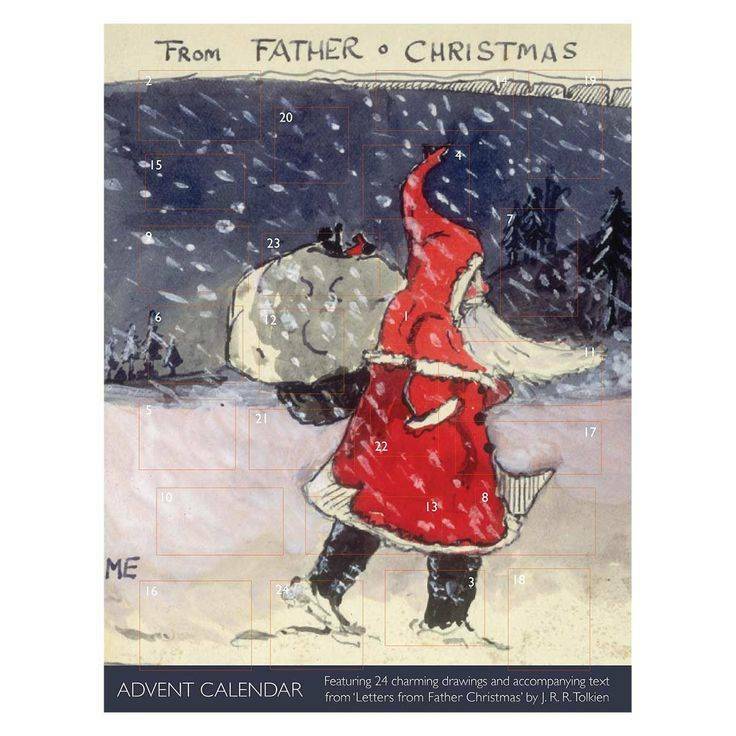 When I was growing up as a wee Irish-American Catholic, my family was big on Advent. We lit candles on the Advent wreath every night at dinner in the four weeks before Christmas, but more excitingly, every morning before school we got to open a new square on the Advent calendar. I’m not sure what it was that excited us most; getting to see a new picture, or knowing that we were one day closer to Christmas, but something about opening a new door every morning was deeply satisfying. 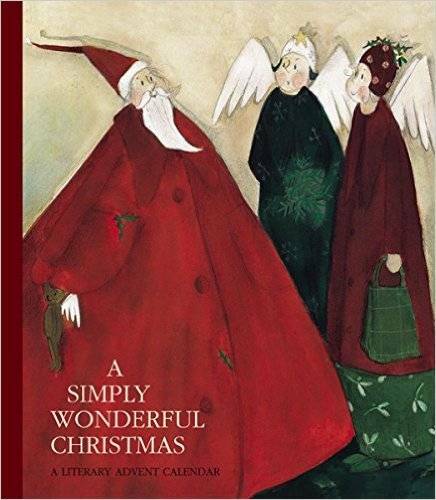 With that in mind, we’ve looked all over the web for bookish calendars for those who celebrate Advent and Christmas. And you know, there aren’t a lot of them. When it comes to Advent calendars, there are a lot of cool 3-D options out there, some of which give you something when you open a door. Still, I think my favorites are the simple ones, made out of cardstock that offer nothing more than the thrill of opening a little paper door. This one, from University of Oxford’s Bodleian Libraries Shop, is perfect. It’s a card, meant to sit on a shelf (and also, it looks like one), and it features pictures from late 19th and early 20th century holiday titles held in the Bodleian’s collections. It’s beautiful, it’s simple and it has all the books. There’s also one for kids. 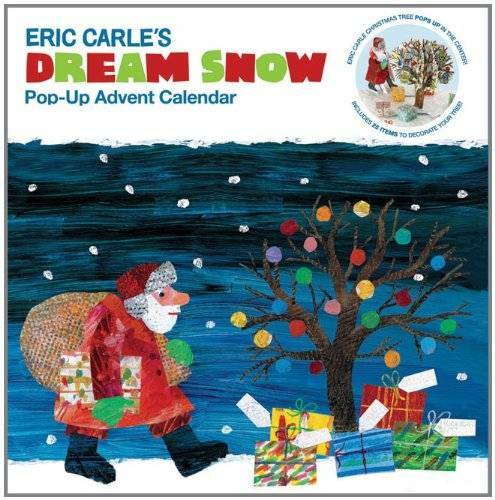 For people with very small children, there’s a calendar by Eric Carle, the artist behind The Very Hungry Caterpillar and Brown Bear, Brown Bear, What Do you See? The days before Christmas are squares on the ground. Each one opens to reveal a paper new decoration to hang on the tree. This calendar is, itself, a book. It contains 24 stories, one for each evening in December before Christmas, and includes tales about Christmas traditions all over the world. Uncover 24 delightful drawings by J R R Tolkien, selected from a series of letters and pictures sent to his children between 1920 and 1943 in response to three-year-old John asking what Father Christmas was like and where he lived. Isn’t that adorable? I need one. Weird & Twisted, an art yarn maker, has been putting together Advent calendars of yarn that tell the story of Harry Potter books. This year, she’s telling the story of Chamber of Secrets. Here’s how it works. When you order, she sends out 24 envelopes containing miniature skeins of yarn she wove herself that tell the story of Chamber of Secrets. The yarns include charms, beads, and quotes from each section of the book. While I get that this is a calendar for people with a pretty specific set of tastes, if you love yarn and Harry Potter, this is probably the calendar for you. Oh, how I wish that this were an actual advent calendar that I could order and put on my mantel, but just because it isn’t doesn’t mean we can’t enjoy it. In 2011, The Committee on Freedom of Access to Information and Freedom of Expression (FAIFE) and the International Federation of Library Associations (IFLA) created an online Advent calendar made up of 24 free videos. Each features a librarian, scholar or other contributor discussing a banned book. You can see the videos here. 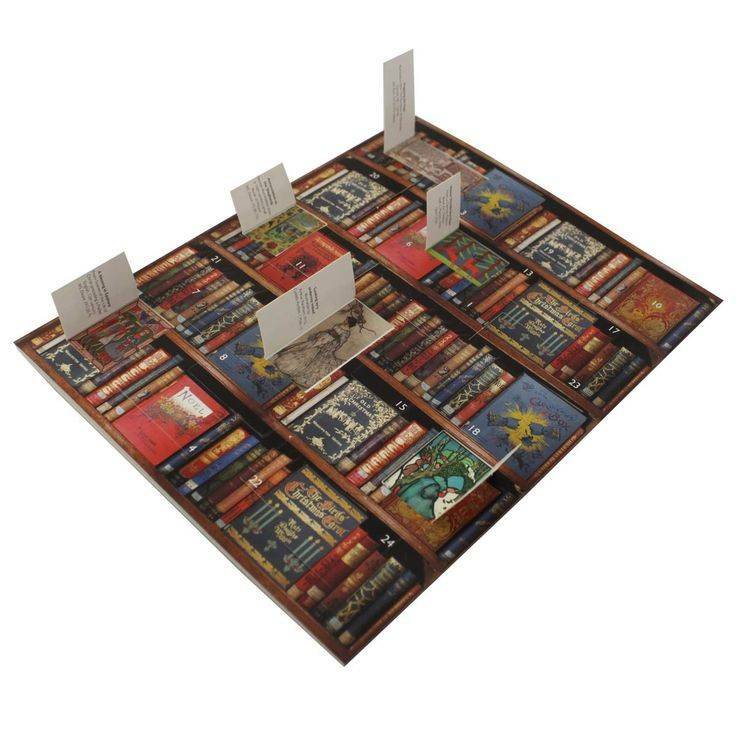 There are, according to Pinterest, approximately 18 kabillion ways to make an Advent calendar, but one of the most popular calendars is book-related: You wrap up 24 holiday-themed books, place a number on each one, and unwrap and read one each day until Christmas. You can choose your own books, and also, you can use holiday books you already own. For more on that, check out this post on Instructables. Sure, it’s not December yet, but let the countdown begin.